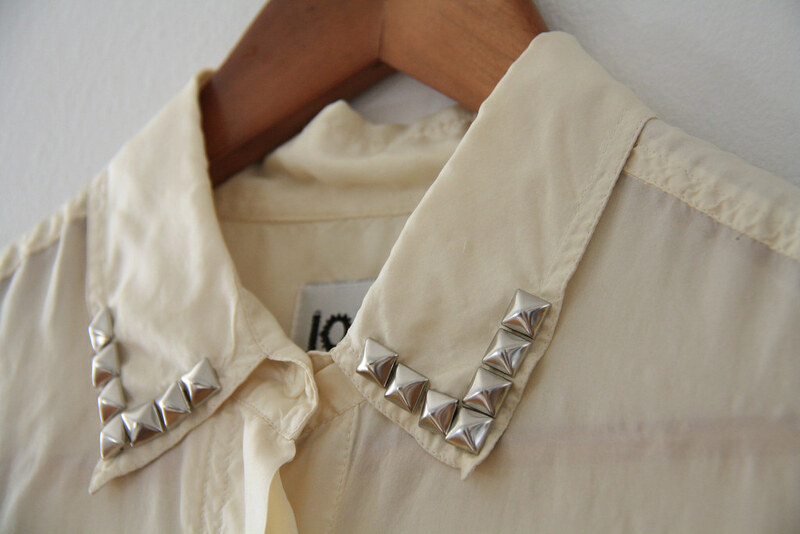 No doubt you've seen studded shirts, shoes, jackets, and all manners of embellished clothing floating around shops and online. I'm a little late to the party but I decided it was time to learn how to stud things, so for this week's tutorial I'm sharing the process. 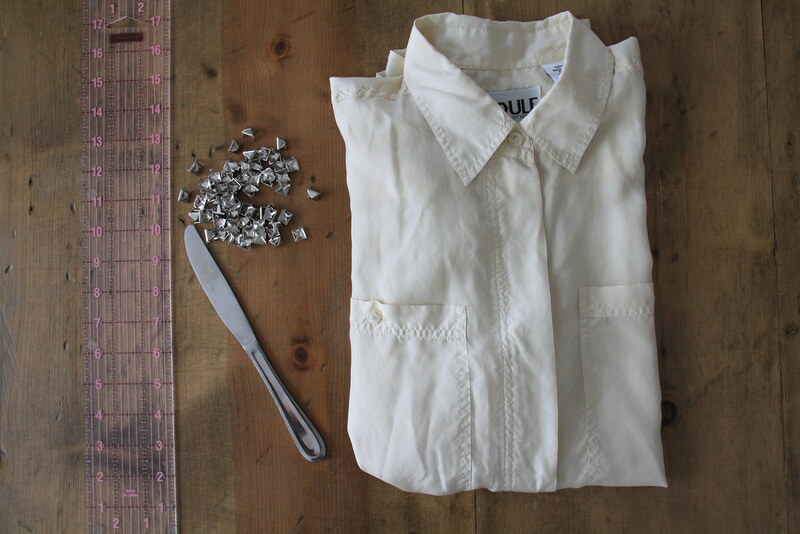 What you need for this project.. studs, a blouse of your choosing (I picked two silk blouses to embellish), a butter knife, and a ruler. I bought nickel plated pyramid studs from a local craft store.. they are 3/8 inch (equivalent to 9.5 mm) in size. You can find studs at your craft store in the leather section, or online for super cheap on Etsy or eBay.. just search for metal studs. 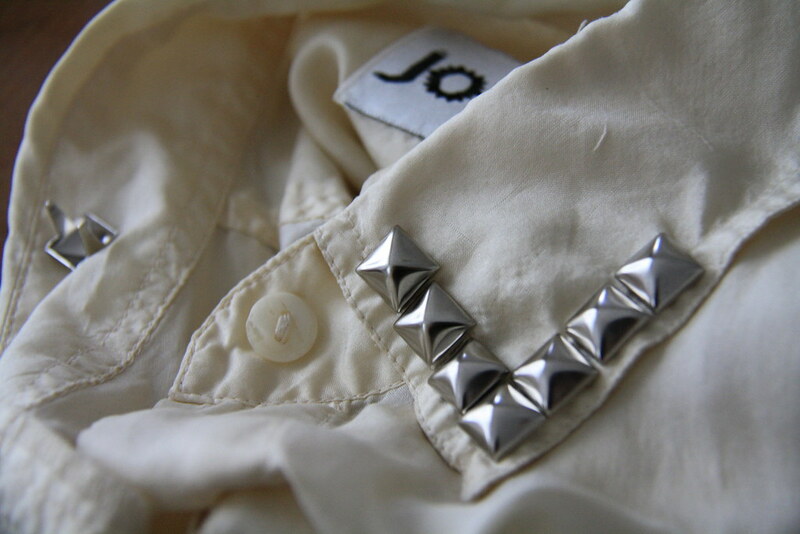 Or buy via Studs and Spikes. 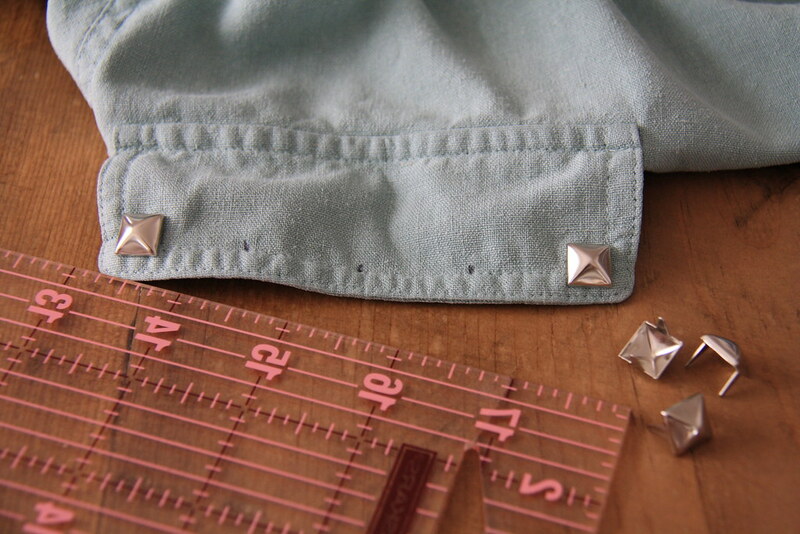 First step.. pick your desired design and start by sticking your stud legs into your garment. 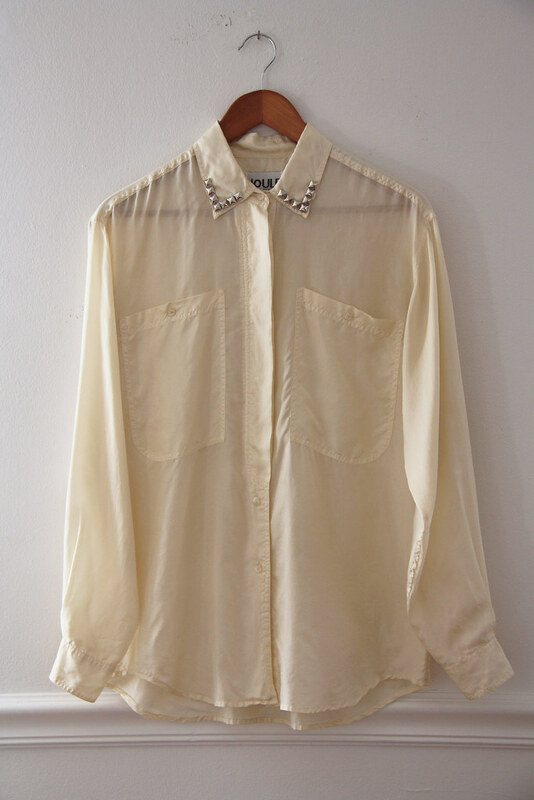 I chose silk blouses to embellish because I love silk and it was lightweight enough that I knew I could easily use studs with the fabric (I originally tried studding a pair of tough leather shoes and it wasn't to be.. if you're planning on studding shoes, make sure your studs are strong enough to stick through the shoe first). 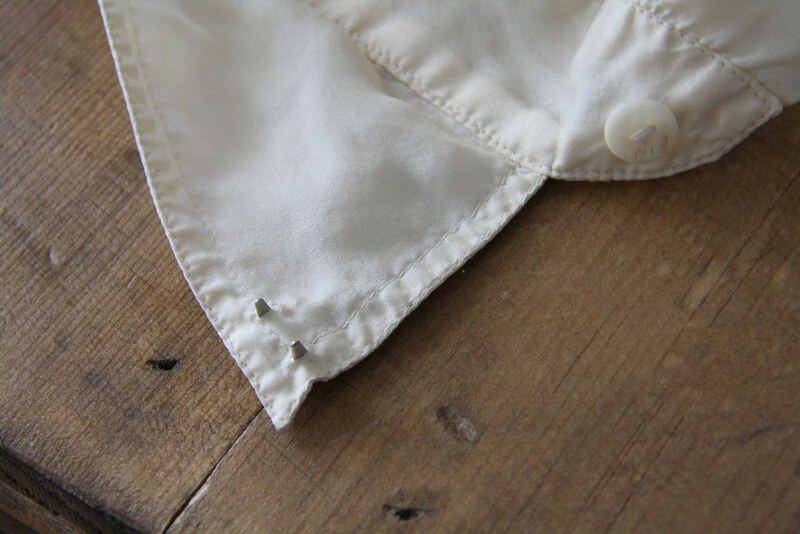 With the ivory blouse, I decided to embellish the collar. I began at the collar tip so I could work my way out, eventually lining four studs on each side. 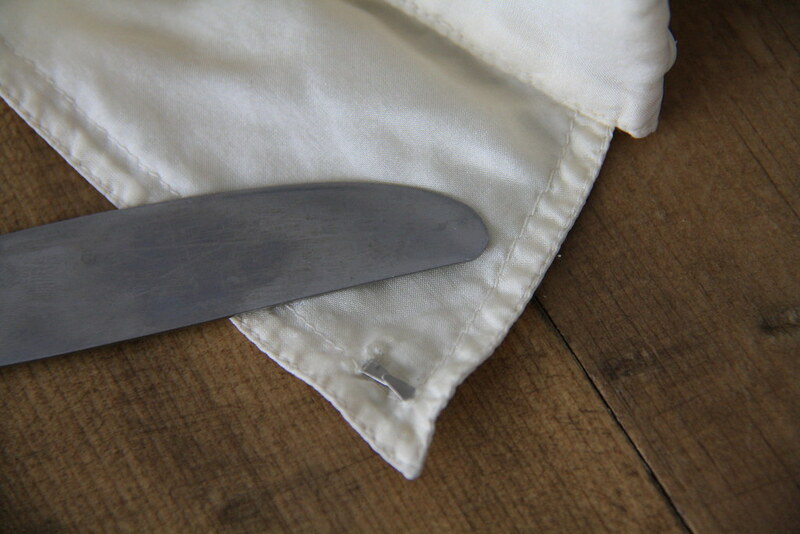 Once your stud legs are pushed through the fabric, close them by pushing the legs inward onto each other using your butter knife. Put pressure on the end of the knife and use that to press the stud in place.. this video tutorial is very helpful for illustrating the process. It is technically possible to use your fingers to push the stud legs in, but you'll end up with some sore fingers - not worth it. Use a knife, it's quick and easy. With the mint silk blouse, I wanted to change it up. The blouse pockets have a flap closure, so I thought adding studs to them would add interest - I measured five even spots on each flap and studded across the pocket border. And that is all. 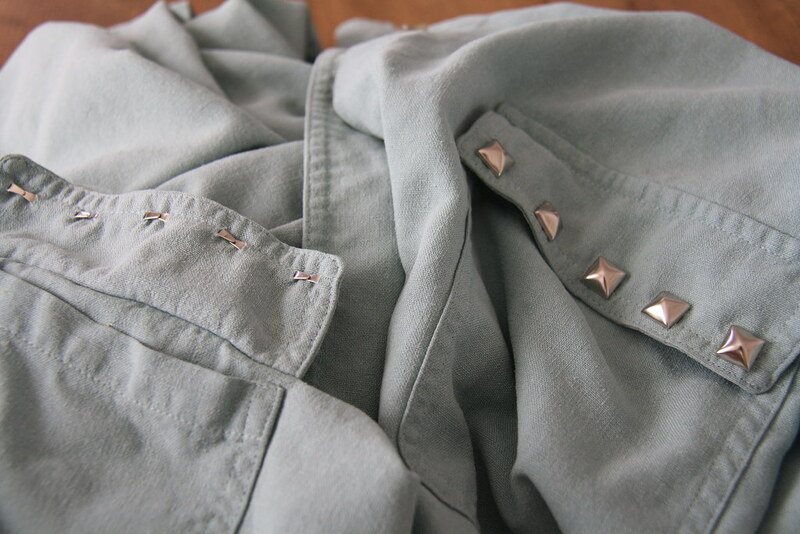 A great DIY for many pieces in your closet - especially feminine dresses and tops that you want to add some edge to. 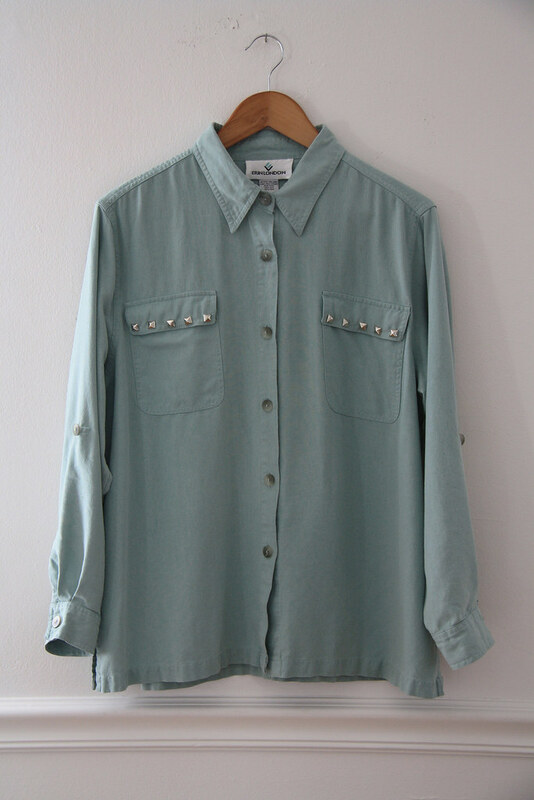 And just for fun, I thought I'd offer a giveaway - the vintage mint silk blouse with studded pockets is up for grabs! One size fits most. To enter the giveaway, comment on this post explaining what you're most excited about for fall (or for southern hemisphere friends, for summer!). Extra entries for those who share this giveaway via Twitter, Facebook, or their own blog.. just add a second comment with the link to the shared post. Be sure to include your email address when commenting. The giveaway is open to everyone and ends a week from today - Monday, September 10. Good luck and happy Monday!